Pierre-Nolasque Bergeret (1782–1863), Marius Meditating on the Ruins of Carthage (1807), oil on canvas, dimensions not known, Dayton Art Institute, Dayton, OH. Wikimedia Commons. Caius (or Gaius) Marius was unusual in having only the two names, and never seems to have earned himself a cognomen such as Africanus, according to Plutarch. He was born of a humble family living in the country well away from the city of Rome, and first came to attention when he was serving as a soldier under Scipio Africanus during his campaign against the Celtiberians in Spain. Marius excelled in his bravery, and Scipio tipped him as a future general. Marius therefore launched his political career when he was made a tribune of the people, and quickly won the reputation of being a formidable champion of the people. When he sought election to higher office, though, he was not only unsuccessful, but ended up being prosecuted and acquitted of bribery. He was next sent to serve in Spain, where his hard work and simple life won him back support, and married Julia, Julius Caesar’s aunt. He then went to Africa as legate, where his fame grew considerably, but he made an enemy in Metellus. Marius returned to Rome, where he was elected consul. 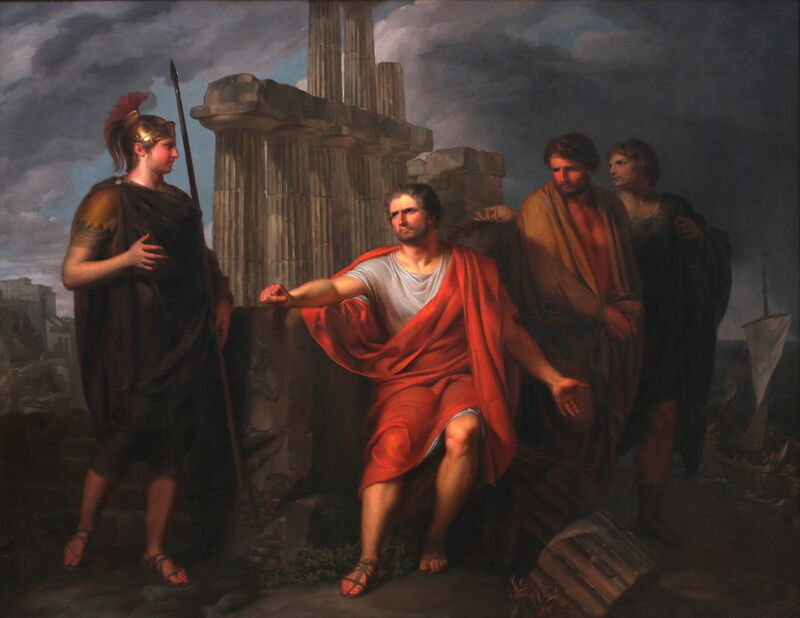 In that high post he proved unpopular because of his bold and arrogant speeches against the patricians, and he became enemies with Sulla, as both men wanting the glory for the successful outcome of their campaign in Africa. As Rome came under threat from the Teutones and Cimbri, Marius was again made consul. Plutarch speculates as to the origin of the Cimbri, but there was no doubt as to the danger that they posed Rome. Marius returned from Africa to celebrate his triumph, and to prepare to lead the army against the Cimbri. Giovanni Battista Tiepolo (1696–1770), The Triumph of Marius (1729), oil on canvas, 555.8 x 326.7 cm, Metropolitan Museum of Art, New York, NY. Wikimedia Commons. 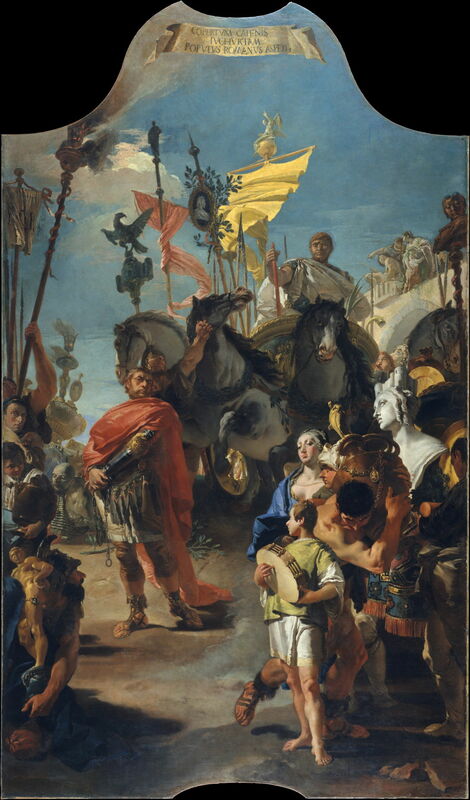 Tiepolo’s painting of The Triumph of Marius from 1729 shows the general in a chariot drawn not by four but three horses, with the defeated and captured barbarian leader Jugurtha in front wearing chains. Marius was thorough in preparing his army, and then had a stroke of luck when the Cimbri made for Spain first. The war was delayed further, and during this period Marius was repeatedly elected consul, ready for war. When the Cimbri started to approach northern Italy, Marius crossed the Alps and his huge army set up camp alongside the River Rhone. 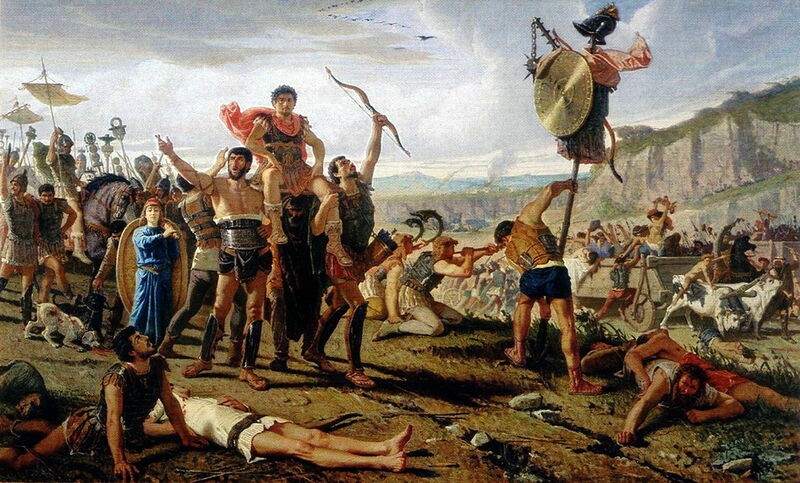 Eventually, the Teutones, Cimbri, and other supporting tribes arrived and challenged Marius to battle. He would not rush into that, but kept his troops in their heavily fortified camp. After time, the Teutones made their way past the Romans, intending to cross the Alps. Marius broke camp and followed them closely until they were close to the Alps, at Aquae Sextiae. The Romans’ first real contact with their enemy occurred there, unintentionally, when both sides were trying to get water from a river. The Romans slaughtered the Ambrones, whose blood made the river run red. Following that, the barbarians marshalled their forces and prepared to fight. Marius took that opportunity to put three thousand men out to attack the enemy’s rear. Marius and his army quickly defeated the barbarians, but news then reached him that his colleague Catulus had not fared so well against the Cimbri, who had now moved on and were ravaging the countryside. Marius was summoned back to Rome, where he refused to celebrate a triumph while the war was still taking place. At this time, Marius modified the design of the Roman javelin, using a wooden pin to secure its shaft. This altered its performance when it struck an enemy shield, and was a significant improvement. 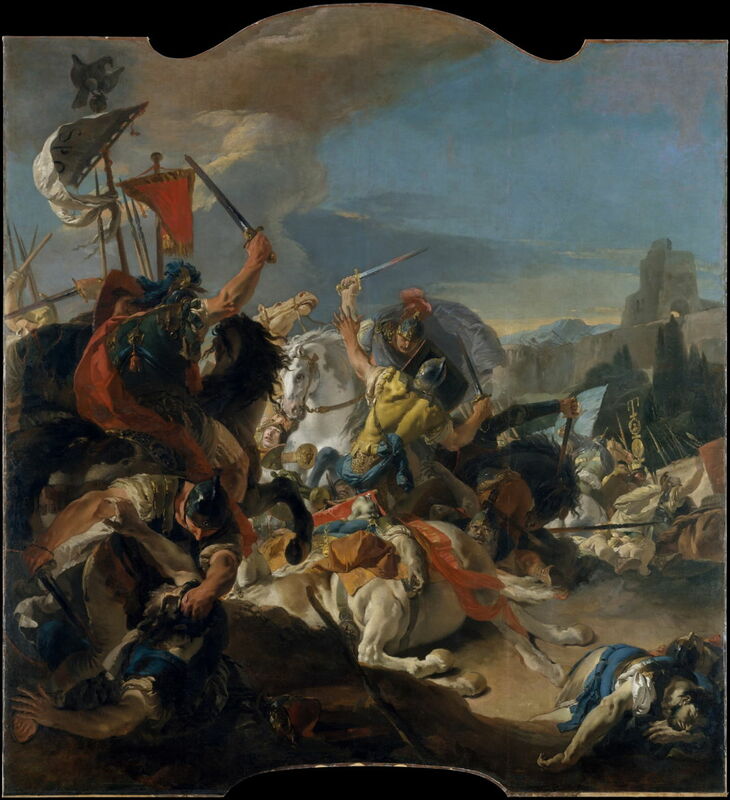 The king of the Cimbri challenged Marius to set a day and a place for their armies to meet, and Marius broke with Roman tradition by telling them that they would do so in three days on the plain of Vercellae, which would allow the Roman cavalry to operate effectively. Marius and Catulus took their armies there, and battle commenced. The day was hot and sunny, which sapped the strength of the Cimbri; the Romans were better accustomed to the conditions, and well-trained by Marius. The Romans overran the Cimbri in a great victory, which was attributed to Marius, but he insisted on celebrating his triumph together with Catulus. Giovanni Battista Tiepolo (1696–1770), The Battle of Vercellae (1725-29), oil on canvas, 411.5 x 376.9 cm, Metropolitan Museum of Art, New York, NY. Wikimedia Commons. Tiepolo’s The Battle of Vercellae (1725-29) shows a scene from the battle, in which the Roman cavalry are fighting with deadly effect. Francesco Saverio Altamura (1822-1897), Marius Victor over the Cimbri (1863), oil on canvas, dimensions not known, Museo Civico di Foggia, Foggia, Italy. Wikimedia Commons. Francesco Saverio Altamura’s Marius Victor over the Cimbri (1863) is a preparatory sketch for a finished painting which is now in the Museo Capodimonte in Naples, a commission by King Vittorio Emanuele II of Italy. It shows Marius raised on the shoulders of his men, being paraded through the battlefield, as the spoils of war are being gathered. Marius was determined to enjoy a sixth period as consul, but made himself hated when he allied himself with Saturninus in murdering rivals and being deceptive. He then spent some time in Cappadocia and Galatia, where he tried to stir up the kings of Asia, in the hope that he would be recalled to Rome to lead its army against them. For Marius recognised that he was at his best leading an army, and at his worst when trying to engage in domestic politics. When war came, against Italian peoples, Marius was hesitant and slow to attack, perhaps because he was growing old. He was made pro-consul in command of Roman forces who next had to tackle the threat from Mithridates. This brought Marius and Sulla into direct conflict, with Sulla leading an army of 45,000 against Marius and Rome. When Sulla entered the city with those troops, Marius fled. He was pursued by land and on water, and several times abandoned by those he had to rely on for his escape. He found his way into the house of a woman, Fannia, whom he had tried when he was consul. Surprisingly, she held no resentment towards him despite the fine that he had imposed on her in the past. Marius finally found a ship to take him on to Carthage, where the Roman governor forbade him to set foot, or he would treat him as an enemy of Rome. He told the governor’s envoy to pass on the message that he had seen Caius Marius a fugitive, seated amid the ruins of Carthage, in a scene which has been depicted in many paintings. Pierre-Joseph François (1759-1851), Marius Sitting in the Ruins of Carthage (1791-94), media and dimensions not known, Royal Museums of Fine Arts of Belgium, Brussels, Belgium. Image by Antoine Motte dit Falisse, via Wikimedia Commons. 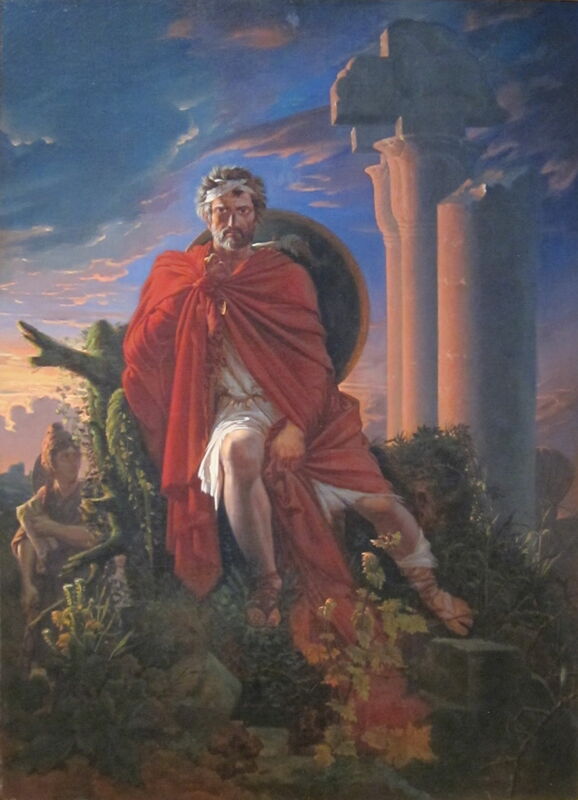 Pierre-Joseph François’ painting of Marius Sitting in the Ruins of Carthage from 1791-94 shows him looking surprisingly young and resolute for a man of over seventy who had been fleeing from certain death. Pierre-Nolasque Bergeret perhaps captures the overgrown remains better, in his Marius Meditating on the Ruins of Carthage of 1807. 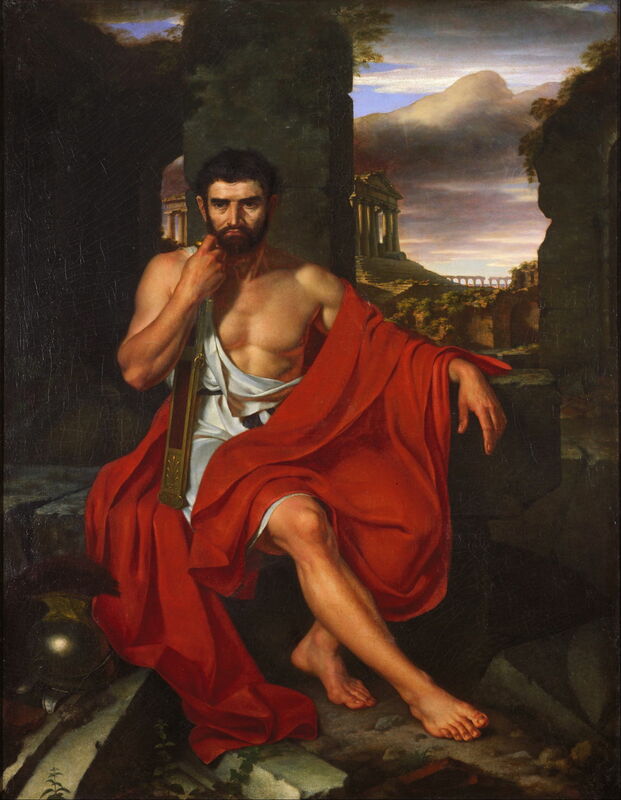 John Vanderlyn (1775–1852), Caius Marius Amid the Ruins of Carthage (1807), oil on canvas, 221 x 174 cm, Fine Arts Museums of San Francisco, San Francisco, CA. Wikimedia Commons. John Vanderlyn’s Caius Marius Amid the Ruins of Carthage, also from 1807, has the general stare into the distance, with his right hand grasping the handle of his sword. It is a curious coincidence that this and the previous painting were made in the same year, but I have not been able to discover a good reason (such as it being the subject of the Prix de Rome) which might account for this. William Rainey (1852-1936), Gaius Marius Sitting in Exile among the Ruins of Carthage (c 1900), in The story of Rome, from the earliest times to the death of Augustus by Mary Macgregor. Wikimedia Commons. 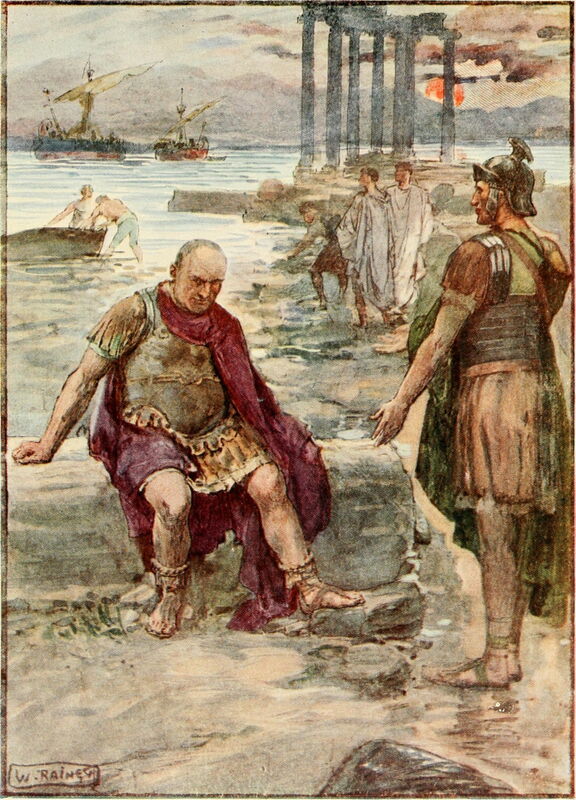 William Rainey prefers a rather obese, grey and balding figure for his illustration of Gaius Marius Sitting in Exile among the Ruins of Carthage, in around 1900. The situation in Rome had deteriorated into its First Civil War, with Sulla away waging war against Mithridates, and Octavius and Cinna fighting one another over the consulship. Marius put together a force of a thousand Moorish horsemen, and sailed for Italy. There, he offered to join forces with Cinna, who made him pro-consul. He seized the port of Ostia, and set out for Rome. The senate invited Cinna and Marius to enter the city, following which there was widespread bloodshed as they stamped their authority and murdered many of their enemies. Marius even went for Catulus, his former colleague against the Cimbri on the plain of Vercellae, driving the former general to suicide. News reached Rome that Sulla had finally defeated Mithridates, and was returning to Rome with a large force. Marius was too old and weary to face another foe: he took to drink in his final days, and died seventeen days after he had been made consul for a record seventh time. The city of Rome rejoiced in the hope that his tyranny and bloodshed were over at last. Marius, whole text in English translation at Penelope. Posted in General, Life, Painting and tagged Altamura, Bergeret, biography, François, history, morality, painting, Plutarch, Rainey, Tiepolo, Vanderlyn. Bookmark the permalink.